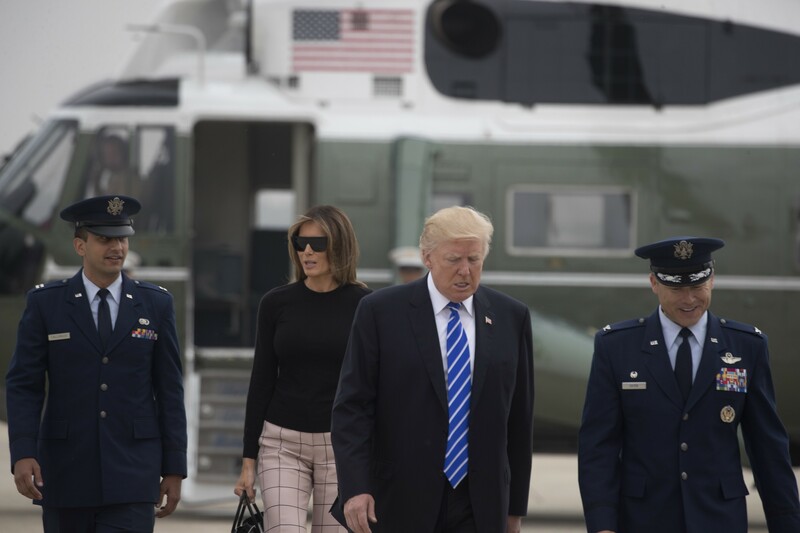 President Donald Trump and first lady Melania Trump prepare to board Air Force One en route to Europe, at Joint Base Andrews in Maryland, July 5, 2017. Trump has plans to meet Russian President Vladimir Putin face-to-face this week on the sidelines of the Group of 20 economic summit gathering in Hamburg, Germany. WASHINGTON — President Donald Trump has been briefed repeatedly. His advisers have alerted him to the web of potential risks, complex issues and diplomatic snags. But even his top aides do not know precisely what Trump will decide to say or do when he meets President Vladimir Putin of Russia face-to-face this week on the sidelines of the Group of 20 economic summit gathering in Hamburg, Germany. And that is what most worries his advisers and officials across his administration as he embarks Wednesday on his second foreign trip, first to Warsaw, Poland, and then to Hamburg. The highly anticipated conversation with Putin on Friday is in many ways a necessity, given the critical disputes separating the United States and Russia. But it is also a diplomatic and political risk for Trump, who faces a web of investigations into his campaign’s possible links to Russia, as well as questions about his willingness to take on Moscow for its military misdeeds and election meddling on his behalf. The air of uncertainty about the meeting is only heightened by the president’s tendency for unpredictable utterances and awkward optics. If Trump’s first foreign trip in May was a chance for him to escape turmoil at home — staff infighting, a stalled agenda and the Russia-related investigations — his second thrusts him into the maelstrom. And at the center of it, Putin awaits. Trump’s team said he might bring up Russia’s documented meddling in the 2016 election, but he is unlikely to dwell on it: Doing so would emphasize doubts about the legitimacy of his election. Aides expect him to focus on Syria, including creating safe zones, fighting the Islamic State group and confronting Putin’s unwillingness to stop the government of President Bashar Assad from using chemical weapons against civilians.